The Valley of Scars is a sprawling camp on the eastern side of Upper Craglorn. It is the headquarters of the Iron Orcs, and is where they are creating their army of nirncrux-infused trolls. 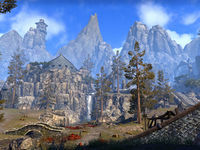 The entrance to the Exarch's Stronghold is located on the northern edge of the camp, while the Valley of Scars Wayshrine can be found to the southeast.